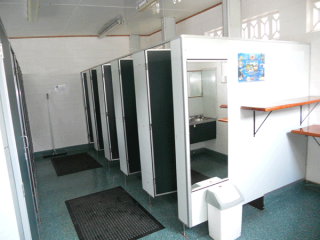 Our communal men’s and ladies bathrooms are located in the main amenities block in the centre of the park. We take pride in ensuring that they are always sparkling clean. Our lovely showers are free and unmetered for everlasting hot water– no fumbling around for coins to keep your shower going! The bathrooms have long vanities with a number of sinks and mirrors. There is a hairdryer in the ladies and shaver plugs in the men’s. We also have disabled-access showers and toilets.